CHARLOTTE, N.C. – For some North Carolina students, learning about solar power will soon be as easy as looking outside their school window. Duke Energy, through Raleigh-based nonprofit NC GreenPower, will invest $300,000 in solar PV systems for up to 10 schools in the state. The program will spur the generation of more clean energy, while creating a learning environment for students. Modeled after NC GreenPower’s Solar Schools program, this particular initiative will pay for 100 percent of the installation costs for rooftop or top-of-pole mounted systems on school property. The program also provides monitoring equipment, training and curriculum to students and teachers. Schools must apply through NC GreenPower for consideration. Information and future applications can be accessed here. Any K-12 North Carolina school served by Duke Energy Carolinas may apply. Consideration will be given to schools that have expressed past interest in solar or schools in economically challenged Tier 1 counties. 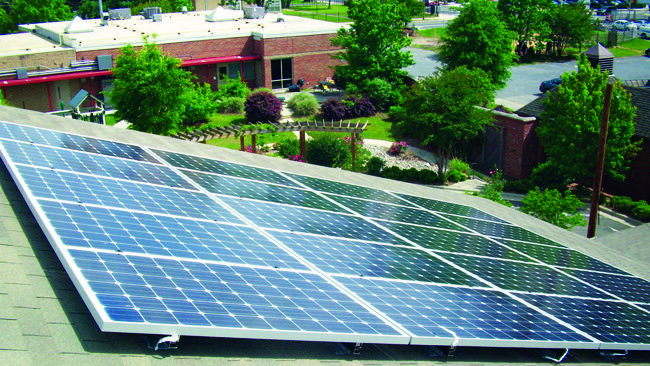 NC GreenPower will use approved solar installation companies to manage the installation process for interested schools. Schools must apply by Dec. 2, 2016. Recipients will be named by Feb. 13, 2017. With a renewable energy portfolio spanning a dozen states, Duke Energy is one of the nation’s leading developers of renewable energy. The company operates roughly 35 solar plants in North Carolina. The state ranks No. 2 in the nation for solar energy. The program is part of a recent settlement with the U.S. Environmental Protection Agency and environmental groups.